For anyone who might have been living under a rock, Outlander is a very popular TV series. Based on the Outlander series by Diana Gabaldon, it is set in the Highlands in the 18th century. It recounts the story of Claire Randall, a married World War II nurse who in 1945 finds herself transported back to Scotland in 1743 where she encounters the Highland warrior Jamie Fraser and becomes involved in the Jacobite rising. Though it takes place within two time-periods, 1743-45 and 1945-47, it is located in the heart of Scotland (for the most part): the Highlands. If we stick to the historical facts, we can plot the area around which Jamie and Claire lived. Whilst nothing yet has occurred in Fort Augustus, the world of Outlander takes you around the Great Glen. In fact, it is in the Great Glen that the story starts: in Inverness. In 1945, Claire and Frank Randall drive to the Highlands on a second honeymoon, celebrating the end of the war and life going on. They stay in Inverness, near which is Craig na Dun (a fictional group of standing stones). These stones transport Claire to 1743, at the exact same location near Inverness. From here, Claire is taken to Castle Leoch, the seat of the Mackenzie Clan. 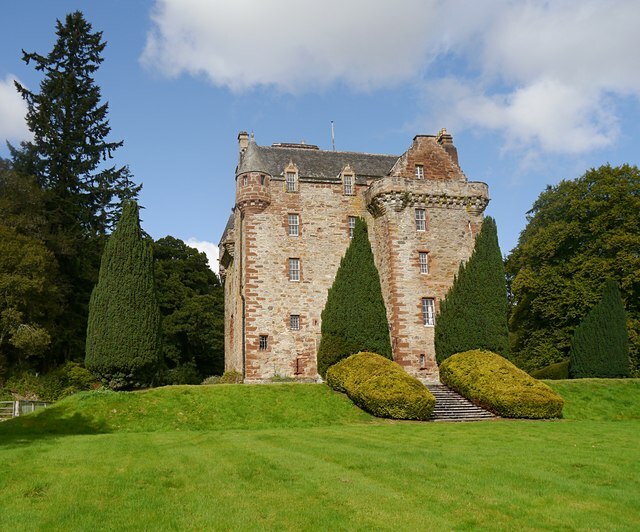 Whilst there is no Castle Leoch in real life, Castle Leod is the seat of the Mackenzie Clan in Ross County. Due to the similarity of the names of the Mackenzie Castles (real and fictional that is), it is likely that Castle Leod inspired the setting for the scenes that took place under Colum Mackenzie’s watchful eye. The map below shows the land that the Mackenzie Clan ruled over, near (and yet far) to Inverness. It would be around this vast Mackenzie land that Claire travelled with Dougal and his company, including Jamie, collecting rents. However, Loch Ness does not lie upon Mackenzie land, so where Claire saw the Loch Ness monster would have been upon another clan’s land. Claire’s weddings would have taken place within the Mackenzie’s land area as well. As the church (or kirk as in Scots gaelic) is fictional, it cannot be said where. From roaming the Mackenzie land, to getting married – Claire is then kidnapped and taken to Fort William, over 60 miles away from Inverness. To travel this distance would have taken a considerable amount of time. These are the only locations of Season 1 that can be certain of location in Scotland in real life! In April/May, 1744, Claire and Jamie arrive in France and land at Le Havre where Jamie’s cousin has a wine business. When they relocate to Paris, the two often spend time going between Paris and the Palace of Versailles, although this does not last long as they quickly return to Scotland to recover from their emotional injuries at the loss of their child. Instead, they return to Lallybroch where they receive word that the Bonnie Prince Charlie has signed Jamie’s name to a letter declaring him the true King of Britain. Charles’ first steps on Scottish/British soil are at Eriskay on the Isle of South Uist, in August 1745. On 21st September, the Jacobites win over the Red Coats at Prestonpans (past Edinburgh) with a Highland Charge out of the morning mist. The Jacobites then go further into England to Newcastle, 3 days ride from London. However, the commanders of the Jacobite army decide to turn back. The last battle the Jacobites won was the Battle of Falkirk. From there, Jamie led the return to Inverness and Culloden Moor and waited nearby.